Now that our 1963 Beetle has 4 wheel disc brakes it needs a master cylinder that can operate them. We swap out the stock single circuit master cylinder for a dual circuit large bore unit. We also install a direct mount brake fluid reservoir and show how to adapt the original reservoir to the new unit. Lastly we replace the rusted front to rear brake line so we won't have a puddle of brake fluid on the floor the first time we slam on the brakes! Hello, Sam here with JBugs.com. Our last few videos have been focused on the pedal assembly and getting our resto custom Beetle converted over to four wheel disc brakes. With the process of the pedal assembly rebuilt and installing new cables covered, we can finally address installing a new large bore master cylinder. This process was filmed along with our last few videos so the pedal assembly was out but the master cylinder can easily be removed with the pedals in place. Our Beetle doesn't have a fuel tank in it, which makes accessing the brake master cylinder much easier. We also have the front wheels chocked and the back of the car is up on jack stands. Inside the car, the two 13 millimeter bolts that hold the master cylinder to the fire wall are un-threaded and removed. Underneath the hood, at the front of the car, we disconnect the font to rear brake line from the master cylinder. The break light wiring and the other two brake lines were removed when we installed the front disc brake kit. The master cylinder can be removed from the firewall. It may take a good tug to remove it and a hammer may help a stubborn master cylinder break free. Others may fall out as soon as the bolts are removed. Now, at the work bench, we can prep our new master cylinder for installation. We're going to be installing an EMPI dual circuit large bore master cylinder in place of the stock single circuit master cylinder. Since the original reservoir only has one feed line, and we need to supply two circuits, we use a direct mount brake fluid reservoir and fill it with the stock reservoir. Use a knife to open up a hole in the top of the reservoir for an early master cylinder grommet. The plastic shavings are cleaned off and the reservoir is blown out. A new grommet is pressed in place. To install [the] direct mount reservoir to the new master cylinder, we have to remove the stock plastic inlets which are twisted and pulled out, so that the new reservoir can be pushed in place onto the grommets. The reservoir will be pulled in and out a few times during the installation but we will leave it in place for now. Two new brake light switches are threaded into the bottom ports of the master cylinder and tightened. Note that no thread sealant is needed on any of the switches or the brake lines. At the front of the car, the new master cylinder is set in place on the chassis at the front firewall. If your pedal assembly is still in place, an assistant inside the car can make sure that the push rod is lined up correctly. The master cylinder can be bolted in place at the firewall. There should be spacers inside the front firewall for the bolts. The spacers will prevent the bolts from crushing the sheet metal as they are tightened. Ours are missing, so caution is used not to over tighten the bolts and collapse the metal any further. Note that while our pedals and master cylinder were out, we cleaned up the rust on the front firewall and sprayed some primer on the bare metal. With the master cylinder bolted in place to the front firewall, new front brake lines are bent and attached to the front left and front right brake hoses and threaded onto the ports on the front of the master cylinder. I bend the lines by hand with a soft touch and use a wrench for leverage on tight bends. A brake line bender is recommended if you find that you kink the lines more often than you actually bend them. At this point we could hook up the front to rear brake line but as there was a lot of rust and pitting on the original one, we decided to replace it to be safe. Inside the car, the remnants of the old carpet [is] removed along with the rear left kick panel to expose the edge of the tunnel on the left side of the car. The brake line of course, attaches to the master cylinder at the front. It comes through the firewall, around the pedal assembly and runs along the tunnel to the rear of the car. Through the back of the floor pan and then connects to the rear left brake line T underneath the car. A flathead screwdriver is used to scrape all the seam sealer off the pan along the tunnel to expose the brake line tabs on the tunnel. The four brake line tabs are pulled up and the brake line is pulled away from the floor pan. The brake line was already disconnected from the brake master cylinder at the front. We unthread the brake line from the rear T, underneath the car at the rear. Back inside the car, the line is pulled in from the front and in from the rear and pulled out of the car along with the original brake line chassis grommets. A new brake line is set in the car and run through the front fire wall and then bent and shaped and threaded into the master cylinder at the front of the car. Inside the car, the line is carefully bent and routed under the rear seat cross bar and through the rear of the floor pan. Under the car at the rear, the line is bent to and then threaded into the rear left brake line T. Now that both ends of the lines are attached, inside the car the brake line is carefully positioned along the tunnel. I start from the back and carefully route the line into place bending the chassis tabs down to hold the brake line in place as each one is passed. At the front, the brake line is routed around the pedal assembly and carefully shaped and bent against the floor. New brake line to chassis grommets are installed at the front and at the rear. At the master cylinder the brake fluid reservoir is pressed into place so we can set up the stock feed line from the original reservoir. A new stock brake fluid reservoir is mounted in the back of the spare tire well. The brake fluid reservoir hose is attached to the port on the back of the reservoir. A new steel feed line is slid into the hose and bent to fit into the lower reservoir then pressed in place into the grommet. This way we will be able to fill the lower brake fluid reservoir from the stock reservoir, using it as a funnel of sorts. This method is much easier than trying to fill the direct mount reservoir when the fuel tank is in place. It uses the stock components which the car is already set up for. With the reservoir hooked up we are now ready to bleed the brakes. Keep an eye out for that video where we will finally wrap up our four wheel disc brake conversion. 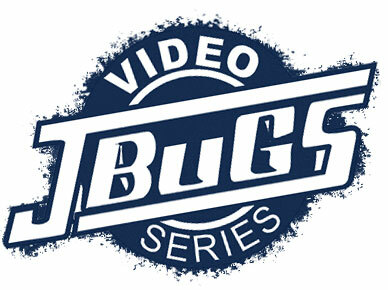 While you're waiting, head over to JBugs.com check out some of our other videos and browse through thousands of parts and accessories for your vintage VW.